With the cool fall weather creeping in and the leaves on the verge of changing, I am reminded that my favorite time of year approaches. Whether in reality or my own perception, I dare say that the fall is becoming more popular in our culture, as every year stores seem to stock more and more Halloween decorations, Facebook and Instagram are flooded with pictures of the leaves, not to mention the frenzied feeding for all things pumpkin (Read: Pumpkin Spice Latte). I will be the first to admit, I too am a sucker for all things fall. The cold rains and cool days, the colors of the trees, and the amazing food produced this time of year can make even me a little sentimental. This really is the perfect time of year. Apple cider, freshly picked apples, S’mores by the fire, this time of year certainly possesses a calming and powerful memory inducing effect. For some reason, I also associate this time of year with reading and academic work. My guess is that overall, I have enjoyed fall semesters in college and graduate school more than spring semesters. Aside from the Stephen King collection (which I must admit, I am a sucker for Stephen King stories), this is the time of year when the Gothic story arrives on my “currently reading” shelf. I should not have to vouch for Edgar Allan Poe; his stories are timeless, atmospheric, and perfectly compliment the dark mood of the season. The one in the picture is the only volume in my possession, but even the smell of the pages evoke memories of cold, cloudy afternoons with a hot drink and dark stories. The Alvin Schwartz stories are especially dear to me. A collection of folklore and campfire tales, I have had these books from the time I was a child and remember being chilled to the bone by reading them. The spooky imagery and often goosebump-inducing endings to the stories are the perfect match for this horror-filled season. As great as these elements are, the heart of the Halloween season for me (which I consider the entire month of October), is still the marathon of horror movies. The perfect complement to the seasonal offerings are the great (and bad) horror movies that scare us senseless. That is why for this Halloween season (and with my new blog), I have decided to pay tribute to my favorite time of year with a reflection on my favorite movie genre. For the next two posts (at this point, I am assuming a trilogy relating to this topic), I am going to talk about my favorite films from a variety of horror genres. If they are films that you are familiar with, I hope you appreciate my comments and insights, and I gladly welcome feedback. If you have not seen the titles that I discuss, I certainly hope my (mostly) spoiler-free analysis inspires you to give them a watch this Halloween season. It is the first of October; the weather will be changing soon, time to turn on the dark! 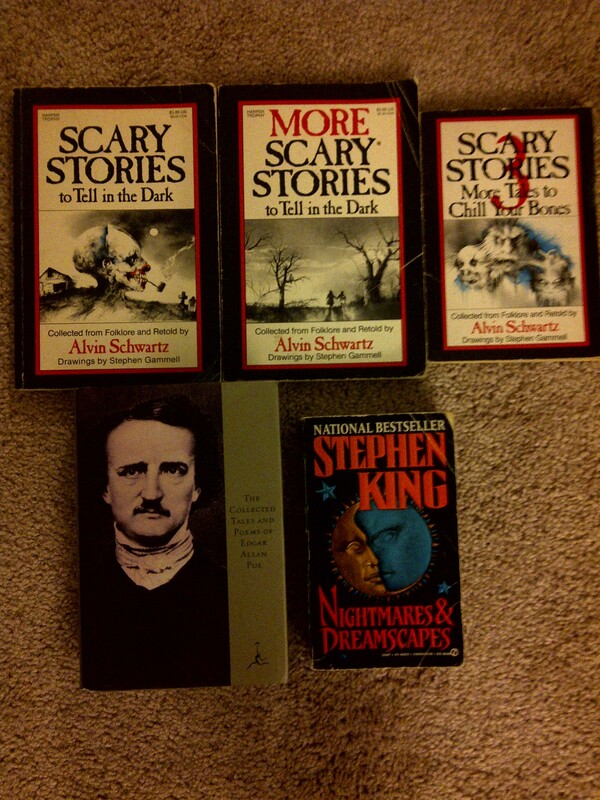 This entry was posted in Life, Movies and tagged Alvin Schwartz, Edgar Allan Poe, fall, Halloween, Horror, Life, October. Bookmark the permalink.